The Sticky Holsters allows for quick deployment and adjustment of a firearm in seconds. No bulky clips or straps to get in the way. This lightweight holsters weigh less than 3 ounces, and the closed-end design keeps lint and dust out while keeping gun oil off the user. Body heat and use conforms holster to the gun, so the holster fit will continue to improve with use. 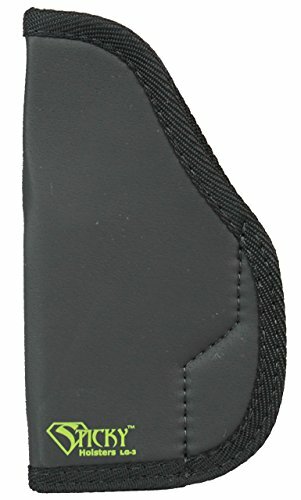 It is also an ambidextrous holster with optimal access for left or right hand users. Suitable for full size Glocks - Large autos to 4.75 inch barrel. If you have any questions about this product by Sticky Holsters, contact us by completing and submitting the form below. If you are looking for a specif part number, please include it with your message.